On November 14, Global TV Toronto did a piece on Ontario's "pit bull" ban which was very weird because it said that dog bites had decreased since the ban was enacted. They have an article at their website which sums up what they presented. "The number of dog bites reported in Toronto has fallen since a ban on pit bulls took effect in 2005, public health statistics show. Provincial laws that banned 'pit bulls,' defined as pit bulls, Staffordshire terriers, American Staffordshire terriers, American pit bull terriers and dogs resembling them took effect in August 2005. Existing dogs were required to be sterilized, and leashed and muzzled in public. Bites in Toronto blamed on the four affected breeds fell sharply, from 71 in 2005 to only six in 2010. This accounts for most of the reduction in total bites." Those of us who follow these things know that bites do not decrease when shapes of dogs are restricted or banned. It hasn't happened anywhere else that has tried this outdated scheme, so why would Ontario be different? If anything, bites usually spike after a ban and I'm not sure why but I suspect it's partly because the non-dog savvy public - the majority of people - believe that all unrestricted dogs are as safe as teddy bears so they end up getting bitten when they act like nitwits around those dogs. Somebody should look into it. Some day. Anyway, in yesterday's Toronto Star, a columnist who actually knows how to dig presented a piece that was the exact opposite of the claims made by Global TV. "...Even so, deciphering the numbers is no easy feat. Toronto alone provided at least three separate sets of statistics that came from only two agencies. Public health numbers — showing dog bites to people — are higher than stats from Toronto Animal Services that measure all bites in total. These contradictions make the statistics confusing. All reports from all municipalities do show similar patterns. The number of reported bites have not substantially dropped since Pit Bulls were banned." I had sent the Global reporter an analysis of why her report on the ban was inaccurate, as was her followup fluff piece on the number of dogs in Toronto. Here's where they went wrong. 1. They don't know how many dogs there are due to poor licensing compliance. Toronto is publicly admitting to around 30% compliance; an article came out the same week saying just that. Therefore, they can't calculate population comparisons of any kind. Global believes there are around 70,000 dogs in Toronto. It's closer to 225,000 based on human population, which would be about right if they have 30% licensing compliance. If they had said 'licensed dogs' it would have been a little more accurate, but they would have to report bites by licensed dogs only to get it right. 2. Their 'stats' are NOT from Public Health as they state, they are Toronto Animal Services bite numbers. I have both. Global sent me the numbers they used, they match the TAS numbers. I admit I haven't cross-checked every single 'breed' but the main ones are the same. What twigged me was when I asked where they got the 'breed' numbers and the answer was Toronto Public Health. TPH doesn't collect breed or shape info so I knew that was incorrect. TAS doesn't get all bite reports, just cases where they are involved or called directly. Public Health gets all reports when medical attention is sought plus all TAS reports involving bites to humans. It's a one-way flow. TAS collects animal to animal bites too though, so their numbers should be higher than they are. Global didn't state in their report whether the bites were overall, or just to humans. TPH bites show stability over the ten-year period, hovering around 1000 bites a year, which, for a city of 2.5 million, is pretty good overall. TAS bites averaged around 380 during the same time period, which is much too low. Looking at 2005, Global says there were 71 bites by 'pit bulls'. That sounds like a lot when stacked against their total for the year of 486 at almost 15% of bites. 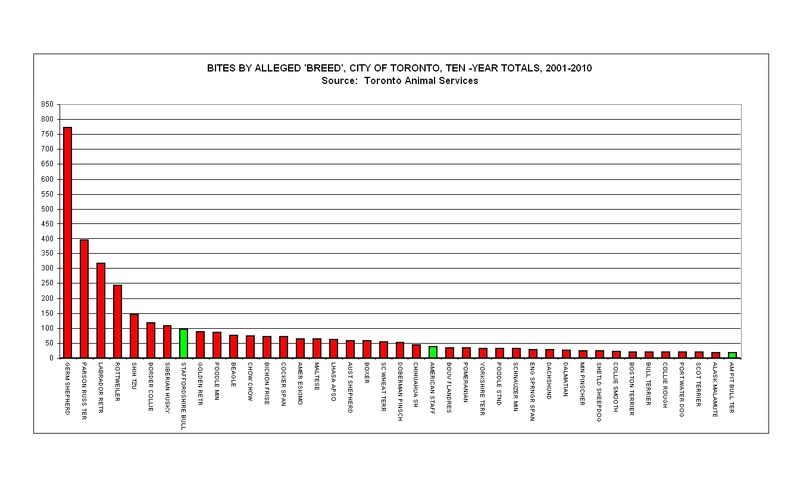 But Toronto Public Health dog bites for 2005 were 963, so the percentage of 'pit bull' bites drops to 7%, which begs the usual question: What about the other 93%? Even at 15%, what about the other 85%? Then there's the fact that 'pit bulls' include three breeds and an unknown number of mixed breed dogs. And of course, that was the year the ban came in, so media and the public were seeing 'pit bulls' everywhere. If anything, considering how many there supposedly are, they are one of the safest shapes around. 3. The 'breed' designations are meaningless, since most 'german shepherds' aren't, most 'labrador retrievers' aren't and obviously, 'pit bull' isn't even a breed. I note that the stats they used show more AmStaffs licensed in Toronto than live in Ontario. There aren't four breeds banned as they say on their website, there are three. 4. At first, I couldn't figure out why their table lumped 10 years of bites together but only showed licensed dogs for 2011, then I realized it was the only way they could do their risk by breed calculation and have 3 breeds and 'pit bulls' show up in the top 20. This is pointless because they don't have an accurate number of how many of each breed or perceived breed there are AND they don't have accurate overall bite numbers, let alone bites by 'breed'. Then there's the fact that unless you calculate based on licensed dogs for the entire period compared with bites by those dogs only for the entire period, your calculations are off. A lot of 'pit bulls' have aged out, moved out or been killed, and no new 'pit bulls' have been licensed since 2005. They are dividing the number of licensed dogs in 2011 by the total number of bites they have for 2000-2009 inclusive to get the risk by breed ratio. I'm no math whiz, but even I can see how rigged that is. I wonder why they didn't include bites for 2010 and 2011? Mixed breed dogs will always be the lead biters, since they are the most numerous of all. What Global is showing looks like a scary statistic but it's actually just a trick that doesn't add anything of value to what we already know. 5. Their line graph stops at January 1, 2010, so it's not up to and including 2010, it's ten years, 2000-2009. So they are doing five years prior to and four years after the ban. They should have gone to the end of 2010. 6. 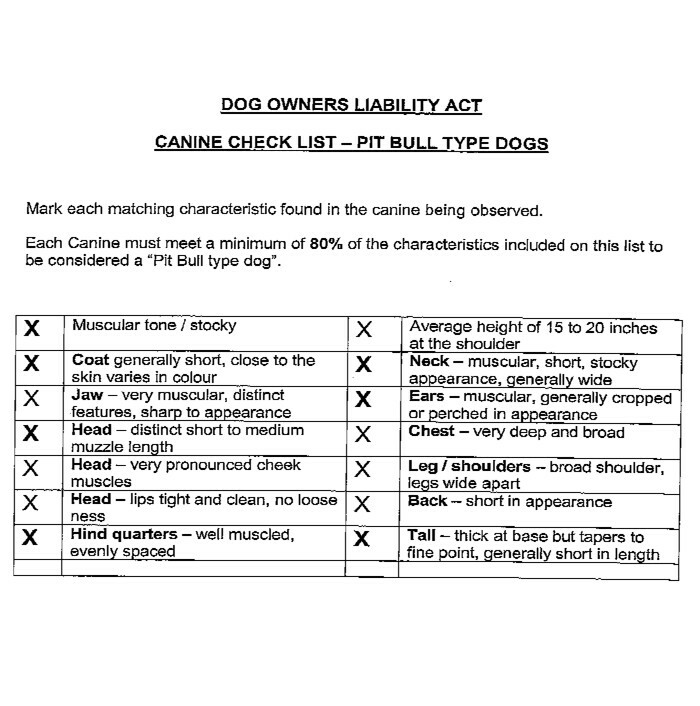 Had they done 1995 to 2009, for example, all types of 'pit bulls' wouldn't have been in the top 20. Their report is a crock. I asked them to correct their website to say licensed dogs, change the source of their numbers, say three breeds instead of four and use the more accurate bite numbers from TPH, which I offered to send to them. I suggested they check with TAS to find out if the bites are only by licensed dogs or if that can even be ascertained. Those numbers could not be extrapolated across the unknown population, but at least they could say this many bites by this many licensed 'pit bulls', 'german shepherds', etc occurred. I haven't bothered to see if any of the corrections have been made. On a comic note,according to the numbers they are using, there were as many bites by 'Domestic Shorthaired cats' as by 'American Pit Bull terriers' in Toronto over the same ten-year period. That number was 20. Somebody fished you in, Global News, likely with a planted story. You guys need to hone your research skills. If it smells rotten, it usually is rotten. Oh, and I didn't need a Freedom of Information request, they just sent the stats along, no questions asked. I noticed you kept shouting FOI during your reports. Maybe that was to deter other people from checking your numbers. It takes more than that to deter the "pit bull" people. You should know that by now.